This triptych commemorates a performance at the Kado Theater in Osaka in the first month of 1823. Matthi Forrer in Stars from the Stage in Osaka: Early 19th-century Japanese Kabuki Print notes on 24 that there were at least two editions of this triptych and that the one with the metallic inks - like the one in the Lyon Collection - is the earlier version. Hokushū skilfully links the composition with a stream flowing across the background and willow tresses cascading from above. There is also an unusual and effective suggestion of illumination: the lantern held up by the crouching figure of Nagisa, on the left, shines on Kochō, in the middle, and she turns her face from the glare. The scene is otherwise set in darkness and the bands of black-and-white stripes in the background, suggesting sudden flashes of light from the jostling lanterns, creates dramatic tension between the figures." Quoted from and illustrated in: Kabuki Heroes on the Osaka Stage, 1780-1830, pp. 274-75. The example shown in this catalogue was from the Gerhard Pulverer collection. "Keisei ōmonguchi (Courtesans at the great gate of the pleasure quarter: けいせい廓大門) was based on Namiki Sōsuke's Ōmonguchi yoroigasane first performed in 12/1743. In that version, Shokurō plots to avenge the death of his father at the hands of Shinkurō. The Keisei adaptation was meant, in part, to feature the female characters. The design shown here highlights one of the memorable scenes when the three onnagata (lit., "woman's manner," male actors in female roles: 女方 or 女形) confront one another in the darkness." 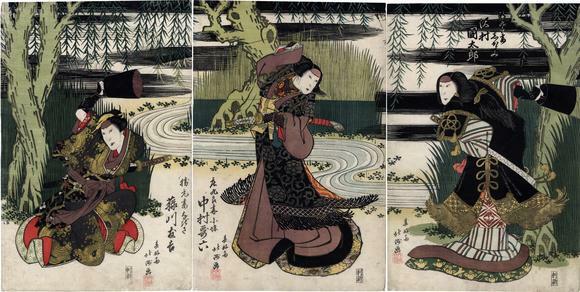 "In Hokushū's dramatic night scene — one of his finest triptychs — Nagisa and Shigarami flank their enemy, Kochō, who turns her face away from the bright light of Nagisa's lantern (andon). Their encounter, a combination of dance and choreographed fighting (tachimawari), featured the onnagata's skills in martial arts as the loyal women carried on the conflict engendered by their husbands. A kabuki critique published the year after the 1823 Kado Theater production praised the actors and their performances in this scene." "Another impression of this design was featured in the 2005-06 exhibition and catalog Kabuki Heroes on the Osaka Stage, 1780-1830 at the British Museum, Osaka Museum of History, and Waseda University Tsubouchi Theatre Museum." This information is taken directly from OsakaPrints.com. There is another presentation of this very scene by three other major Osaka artists. It too is a triptych. The left panel is by Ashiyuki, the middle by Yoshikuni and the right by Kunihiro. The publisher was Tenki.